If you follow me on Instagram (@louisekwilliams) then you might have seen me upload some pics of my recent weekend trip to Bristol. J's Aunt and Uncle live in a gorgeous little village just outside of Bristol city centre in a beautiful house with an equally beautiful kitchen. It was't a long trip, just two nights and three days, but it's been ages since I've had to 'pack' to go anywhere so I thought I'd put together a little post about the products I took with me in my skincare / makeup bag. The bag itself is from Victoria's Secret and I bought it when shopping in London for my birthday back in March. It came in a pack of three, with this larger sized one housing a much smaller plastic material pouch and then a sequinned pouch in a medium size. I absolutely adore this set and know that Victoria's Secret do similar in other patterns if you ever happened to be near buy and fancied purchasing one! I originally toyed with the idea of putting all my skincare in one bag and makeup in another but found that this fit everything in one, both handy and space saving! I'm not sure if I want to combine the two again if I go away (i.e for my hol to St Lucia in September) but for a quick weekend away it didn't really matter to me that everything was all jumbled up. I took a pretty good selection of makeup and brushes with me for the weekend because space allowed. I brought along my Real Techniques powder, blush and dual fibre contour brushes, along with a little pinkTopshop foundation brush. I adore Real Techniques brushes and have just seen that some teeny tiny travel sized brushes have been brought out - I'm definitely buying those in time for September! In terms of base, I brought my Origins Make A Difference + moisturiser to pop underneath YSL's Youth Liberator foundation and my Nars radiant creamy concealer. Over those I put my Bourjois Java Rice Powder, and experimented with a new bronzer, Maybelline Dream Sun (in blonde, which I am not, but I was afraid of having a heavy bronze on my pale skin!) and a new illuminating powder from L'Oreal in Rose Boudoir. For my eyes I took along my favourite L'Oreal superliner, Maybelline's Master Kajal khol pencil and Benefit's They're Real mascara for a super simple winged eyeliner look. On my brows I wore Soap & Glory's Brow Archery pencil in Brownie Points and finished off my face with MAC's mineralize blush in Dainty. I also popped a selection of lip products in my makeup bag as I never like to only take one in case I don't fancy wearing it - anyone else feel the same? I did take my Kate Moss for Rimmel lipstick in 101, a Chanel Glossimer in 148 and a new Topshop Lip Paint in Reminisce (which I am absolutely loving!). J's aunt also bought my a Lanolips lip balm which I am currently trying out. The other bits and pieces you can see above are my current go to fragrance, Armani Si, some cotton pads, two nose pore strips that we never actually got round to using, a Bath & Body works pocket bac hand sanitiser, a Butter London nail polish in Toff (another gift from J's Aunt), a Bath and Body Works Coconut & Lime mini body lotion and the most ingenious travel invention for cotton buds that I bought in Walmart in Florida a year and a bit ago. And finally, here's what I took skincare and haircare wise, from left: Clarins One Step Gentle Exfoliating Cleanser (not mine, but I borrowed some from J's Aunt because I actually forgot to bring a cleanser of any kind! ), Avene Eau Thermale Spring Water mist, Origins Drink Up Intensive Overnight Mask, Milk_Shake leave in conditioning mousse, Benefit It's Potent eye cream, Bumble & Bumble Thickening Shampoo and Conditioner, an Oral B 3D white sample sized toothpase, Dove Pomegranate deodorant, Caudalie cleansing water and a Balance Me body wash from a recent Glossybox. 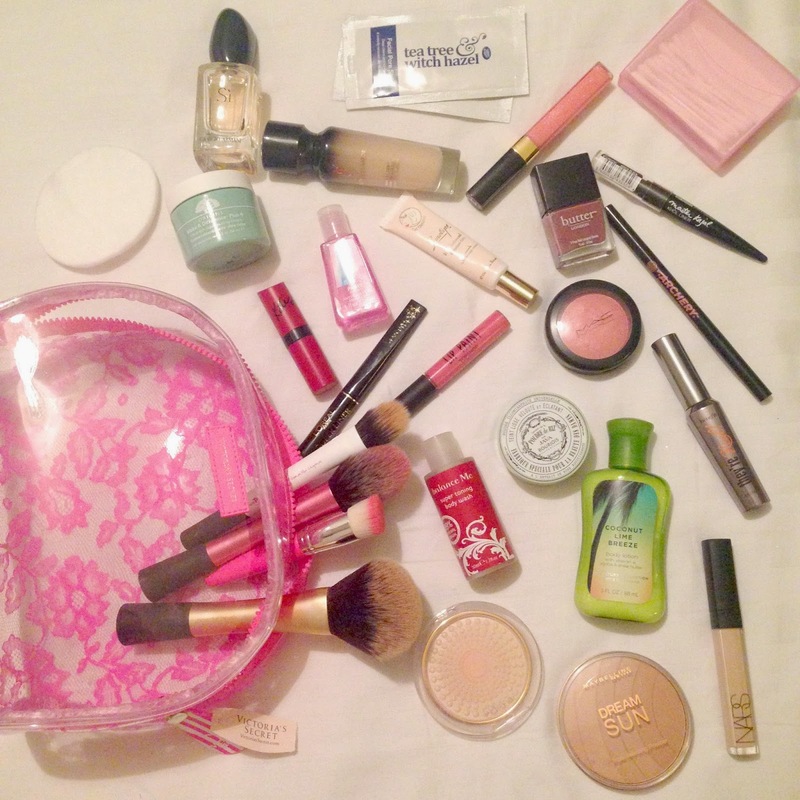 I love using travel sized products, and had such fun picking out what I wanted to bring with me in my makeup/skincare bag. It's got me in a such a holiday mood...only 111 days until St Lucia...! 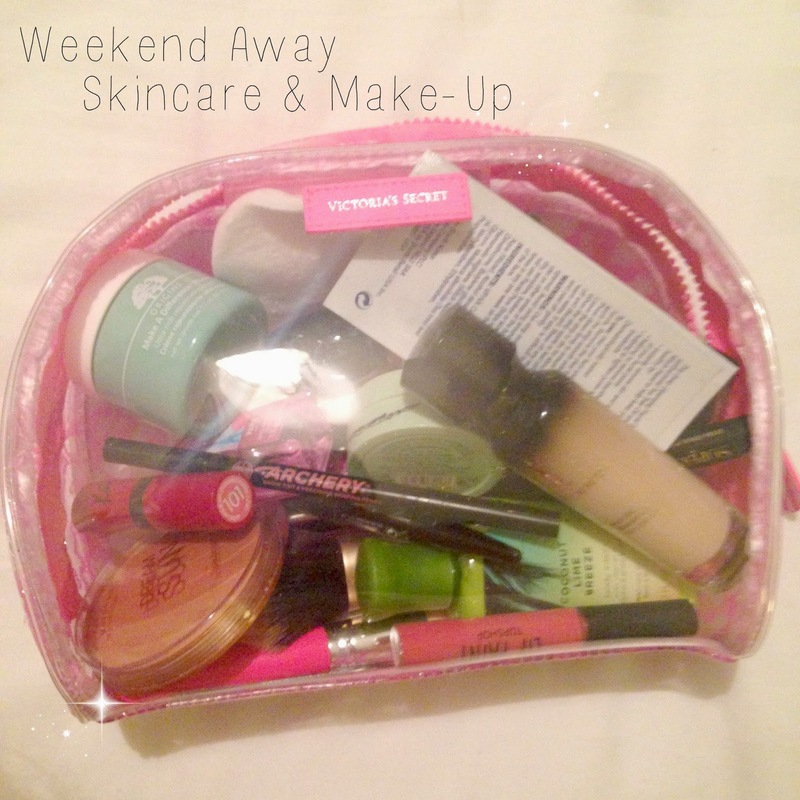 What do you take with you for a weekend or a mini break away? 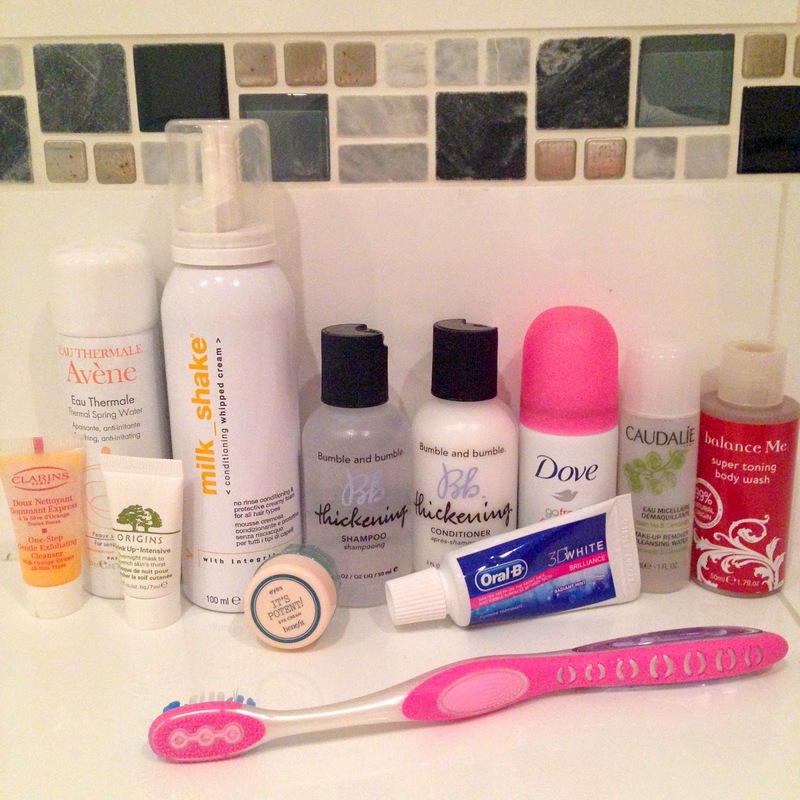 Travel size products really are a lifesaver. Hope you had an awesome time.